Playwin, recently in a ceremony held in Mumbai handed-over cheques amounting to more than Rs. 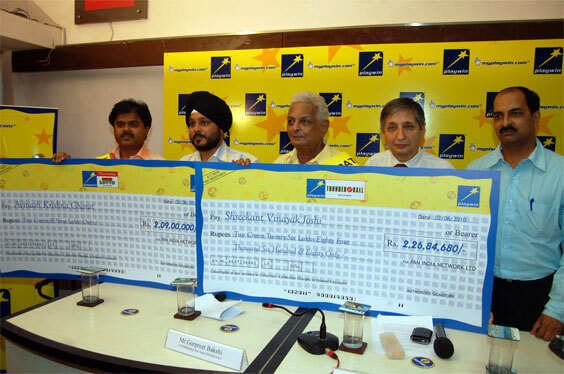 4 crores to their various jackpot winners. Rajesh Bhasin, Chief Financial Officer and Gurpreet Bakshi, VP-Marketing, Pan India Network. Ltd. handed-over the cheques for the amount of Rs. 22684680.00 and Rs. 20900000.00 to Shreekant Joshi and Avinash Gharat respectively. Along with these crorepati winners 14 Fast Lotto winners were also handed-over their winning cheques. Commenting on the occasion, Gurpreet Bakshi, VP-Marketing, Pan India Network. Ltd. said, "Playwin through this cheque handover ceremony strengthens its position as one of the most transparent players in the market. Over the years, Playwin has created a number of winners and have helped them to fulfill their dreams and long cherished goals. The jackpot win is a product of sheer perseverance on the part of its winners combined with an element of luck. We at Playwin, promote responsible gaming and stand firm on our pillars of operational transparency and legality across gaming business. It brings us immense pleasures to witness our winners who have won our lottos pursue their dreams. We have been constantly trying to reach out to people from every segment of society, and have received a really good response from them so far. Till date Playwin has announced 71 crorepatis and over 3,000 lakhpati's from all over India making it one of the most successful forms of gaming within a short span of 8 years since its establishment. Playwin has changed the perception about lottery and is now widely accepted by all Socio Economic Classes today. The jackpot wins of our 2 Lucky Crorepati winners and 14 fast lotto winners further re-emphasize this fact. By creating winners, Playwin has helped them to fulfill their long cherished dreams. Mr. Shreekant Joshi (76), as a resident of Mumbai city and currently enjoying retired life feels proud to be the 69th Playwin crorepati. His luck stuck with Playwin's Tuesday Thunder Ball's winning nos 20 22 25 40 42 TB 06. According to Joshi, At the age of 76 a new chapter has started in my life and I'm very excited about this win. This win has a very special place in my life. I feel more relax with this true pension plan at this age. Avinash Gharat (45) is a resident of Alibaug and currently working with Reliance Industries as chemist. He is Playwin's 68th crorepati and his luck struck with Playwin Thursday Super Lotto's winning numbers 07, 09, 21, 27, 39, 49. In excitement Gharat mentioned that, This jackpot win has truly changed my life around. I can now fulfill all my long cherished dreams. I look forward to an enriched life after this win & my major focus will on children's education. Rajesh Bhasin, CFO, Pan India Network Ltd. said, Playwin has always recognized its responsibility towards the wider communities they operate in. As a gaming company, we operate with various gaming platform such as retail terminals, online presence through myplaywin.com & mobile presence through SMS mode. Playwin has become most successful forms of gaming within a short span of 8 years since its establishment. With a winner created every five seconds, Playwin creates around 400,000 winners everyday which gives ample testimony to the fact that Playwin is not only the most popular platforms for gaming, but the most credible one as well. And currently two of our jackpots have crossed Rs. 6 crores magic figure.